CAN repeaters are transceiver based devices that allow CAN networks to be extended by regenerating the CAN bus signals. They are particularly useful in establishing more advanced network topologies, stub-lines and stars being examples, with a view to increasing flexibility and reducing the size and cost of a CAN system. 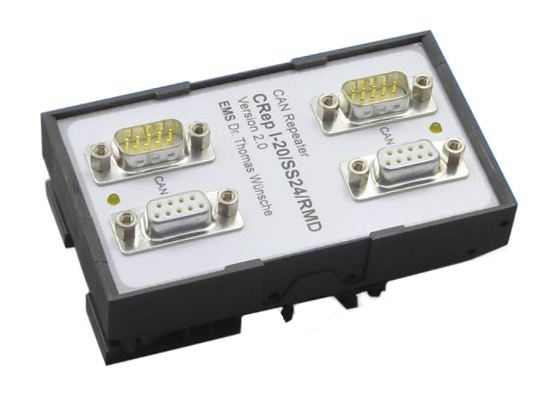 The CRepN CAN Bus repeater transmits and amplifies CAN signals transparent to the CAN protocol. CRep N allows the design of flexible wiring topologies. Star and tree structures as well as stub lines can be realized. 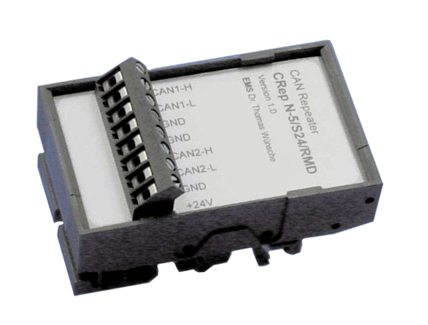 CRep Opto is a galvanic separating CAN repeater for rail mounting in switch cabinets. CRep Opto allows the isolation of local errors, that means, in many cases errors occuring in one of the segments don't lead to permanent perturbations of the whole network. 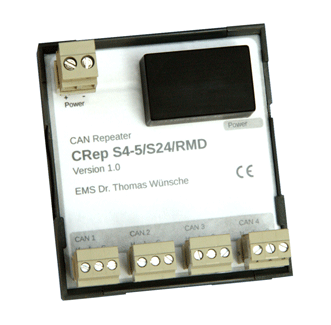 The CRep S4 4-channel CAN Bus repeater transmits and amplifies signals transparent to the CAN protocol. Each of the four CAN connections has the physical behaviour of a single bus node. CRep S4 permits a flexible design of the network topology and offers special support for star structured networks. CAN bus requirements beyond Repeaters? The above CAN bus Repeater is complemented by an extensive range of PC Interfaces, gateways, fiberoptic, and distributed I/O interface products, providing the systems developer with a comprehensive toolkit for implementing a diverse range of CAN bus system implementations.